You've gotta love a Canadian who defends America. TL Tyson is the cutest thing ever and her "Don't hate, appreciate. Anti-Americanism" vlog is awesome. That's all I have for today. Hope you have a great weekend! Well bless your heart!!! (No I'm not southern! lol) I seem to have an internal radar that makes me check my blog feed within minutes of your posts. We are connected on another plane of existence! Thanks for pointing us to some good ones! I love finding new friends in the blogosphere. Nicole, you have awesome-dar, it's kind of like gay-dar but you can detect when awesomeness spills into the universe. ;) I think you're southern and you just don't know it, like from a past life. We must have been best friends back then and the universe has put us back together. Of course I like your connected on another plane theory too. Catherine - I've gotten lots of giggles from Nicole the past couple of days, she worth getting to know. I adore TL Tyson on twitter... I've caught a few of her vlogs and they're always great! The new year's one with her top ten resolutions was fun, and I LOVE Roni Loren...I've followed her since forever and a day and every time I go to her blog I learn something. 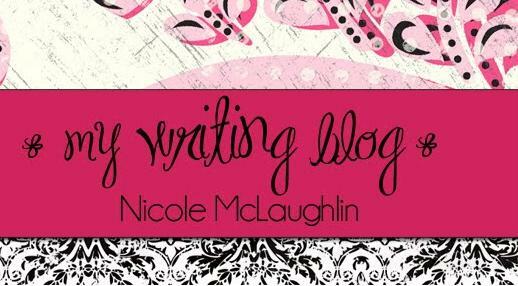 Thanks for the tip on Nicole's blog, she is new to me! TL TYson is so fun, I found her though @branali , i think. Love her. Roni is just a wealth of knowledge and this new girl Nicole, total sweetheart!